Who doesn’t love a good sunset? 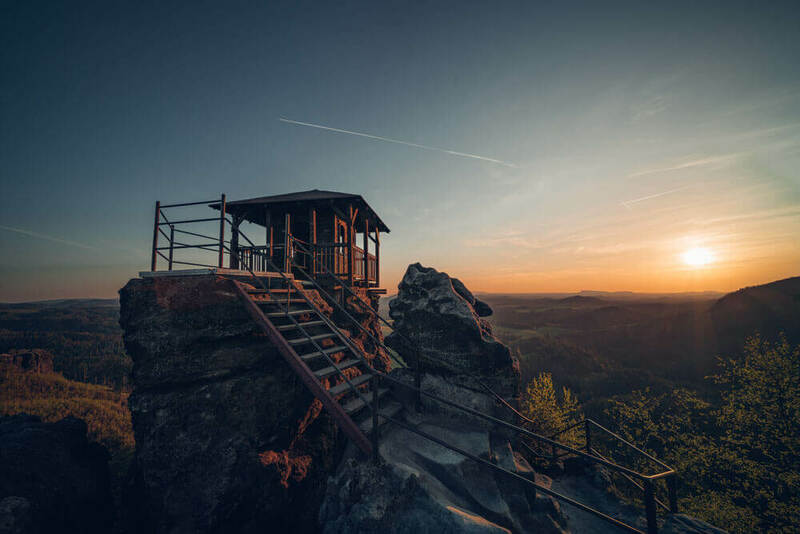 After a long day of hiking through the lush Czech nature and stunning Bohemian-Saxon Switzerland National Park, surely catching a sunset is the reward for all the effort. 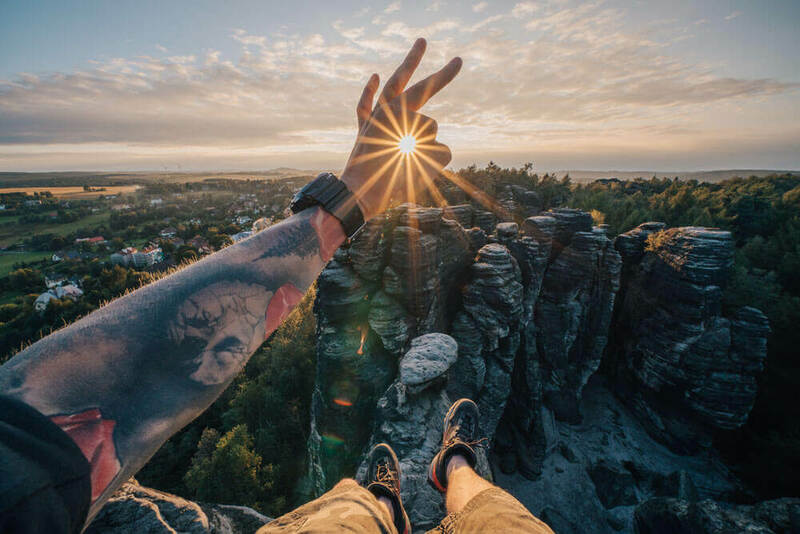 Sure, we more or less witness the sun disappearing on the horizon day in and day out, but this phenomenon never gets quite old. If you are a photographer, you live for that golden hour or two when the light hangs just above the earth, casting that warm light that makes everything suddenly seem euphorically beautiful (but also gives you the best angles, depths of field, and shadows, we know but let’s not take away the magic). 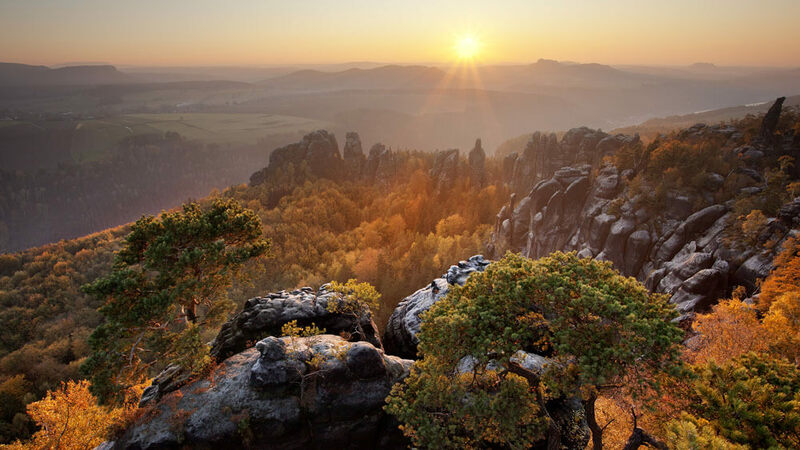 In Bohemian-Saxon Switzerland, the rules are no different – the landscape and sunsets were made for each other. 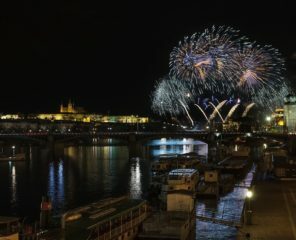 There might not be a better way to witness some of the best natural wonders the Czech Republic has to offer. Curious how you can witness this little slice of magic in the park? We’ve got five different ways you can enjoy this magical occurrence, all within the boundaries of the park. It’s too bad you can really only pick just one! 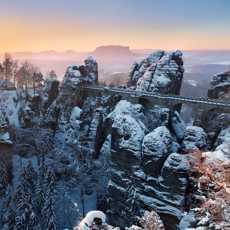 A visit to the Bastei bridge during sunset will be an experience unmatched. As you walk across the first-ever bridge created for tourism on the German Saxon side, look west into the Elbe canyon below. 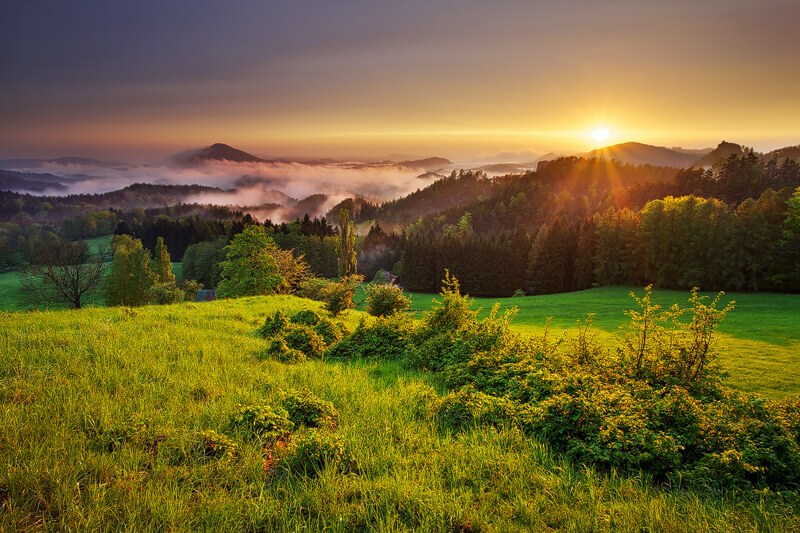 The sun casts the perfect golden-hour light over the river valley below and looming, distant mountains. Now you see just why this bridge was created – simply to enjoy the view. Perhaps after witnessing in this breathtaking view, head back in the directions towards the main lodge and veer right, on the trail for a second perspective. 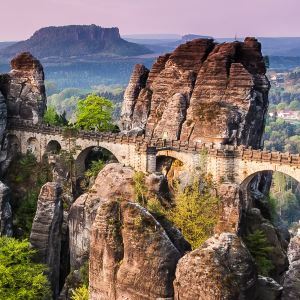 It should lead to a set of stairs that elevates you to a 360 degree view of the sandstone cliffs and Bastei bridge alike. Catching this view in the afternoon sun backlights the bridge warmly, giving it that picturesque glow – the ideal spot for photo enthusiasts to capture their own postcard moment of the bridge. 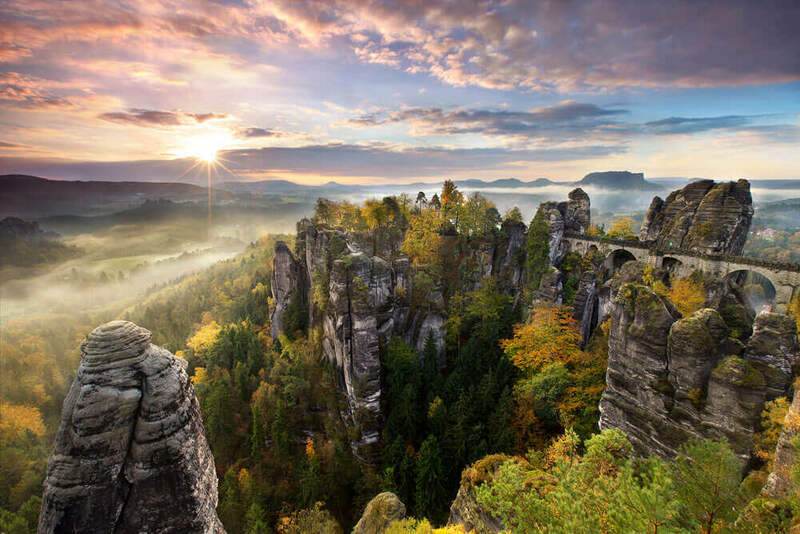 These jagged masterpieces that jet up from the earth offer another fantastic view to watch the daylight fade away. 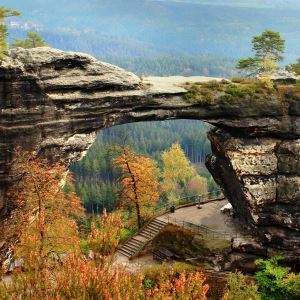 The lookout point from Schrammsteine is one of the most viewed in the Bohemian-Saxon Switzerland National Park, and for good reason. 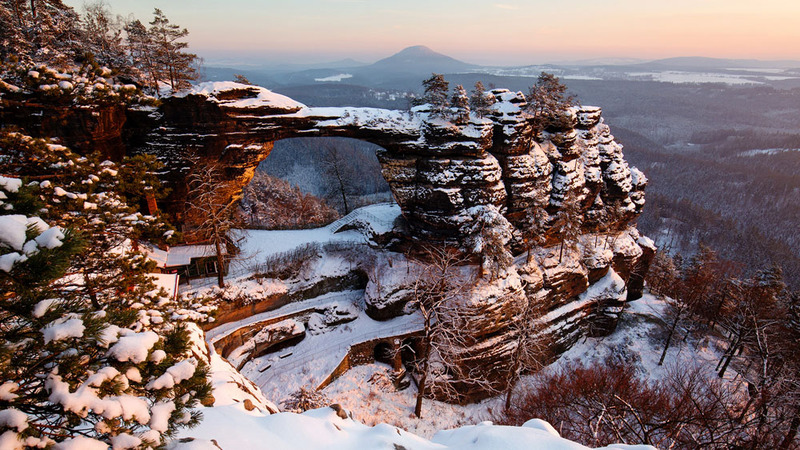 They are some of the most distinct of the Elbe Sandstone mountains. Looking off into the distance you see more steep cliffs like teeth on the horizon, creating a seemingly endless sea of sandstone monuments. Tisa, a hidden secret and a local favorite is the filming site for Chronicles of Narnia. As you can imagine, visiting here during the winter is nothing short of magic. Catching this spot covered in snow feels exactly how you would imagine walking through the wardrobe would feel like. But Tisa has another secret, it’s a stunning spot to catch the sunset, at anytime of year. Wonder a top the the famous sandstone cliffs that give you a direct view of the village set amongst the trees below. Watch the sun disappear beyond the horizon and reflect on the day. Another idyllic place very much off the beaten path, and perhaps the most well-kept secret, is Mariina Skala, or Mary’s Rock. The hike up is strenuous and steep but one, with over 600 stairs. The effort will be well worth it with views of sweeping vistas, and even a brilliant sunset if timed correctly. Surely, the Bastei bridge is every bit stunning, but this unique view my friends, is far less visited. 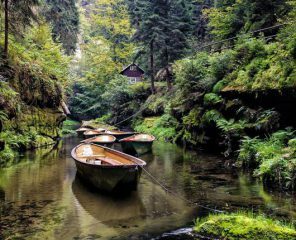 Perhaps the most popular trail in Bohemian Switzerland is Gabriela’s trail, for it’s relative-ease making it widely available to hikers of all ages. This gentle trail lets you see the very sandstones that shape the landscape up close before looking down on them from above. Just picture that warm light hitting the rock face and lighting up like fire. Surely the reward after the six kilometer hike you just made to get there. Add some fiery red and yellow leaves freckling the canyon, and what more could you ask for? 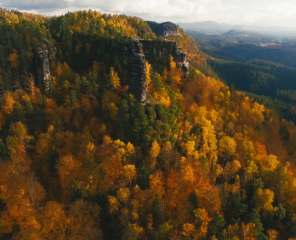 The presence of autumn foliage certainly puts this view over the top. Besides being just plain beautiful, we know our beloved park is a photographers dream. Interested to see such sights in the other seasons where sunset is often much later? We can arrange custom private tours to meet your adventurous desires, allowing you to enjoy the park as you please and hopefully providing you with an unforgettable experience complete with that postcard-perfect picture (and maybe a beer).